Whoa, lots of underrepresented games. Well, they're represented now. Kaikuluotain (Batman) has nice drive. :3 I feel a little Rockman in there too, somewhere. *-) 1:45 is great. Taken (DK). Oh that cowardly ape. c: My favourite section is the xylophone at 2:17. Dreamboy (Smurfs' Nightmare). They made a game about giving smurfs nightmares? o_O Wow, that is messed! The whistle from 2:42 could be from Phendrana Drifts. Nice. Alien Territory (SolarStriker). The sound from 1:07 to 2:00 is terrific! Such neat background sound. :3 The melody from 2:01 to 2:45 is really cool, especially the pick up at 2:24. Technomagmar (P: Red). Sheeeh, this could from Road Rash: metal edition. :3 The melodies are great and it changes up a lot. Gift of the MAGI (FFL II). Invokes the 90s. c: Ooh that synth woodwind is so nice. Awesome work guys! I'll be listening to this for a long time! What a good album! I'll be sharing this with my friends. Is it too late to take all credit now? Because I'd love to. I'm glad the project ended up in the right hands. I honestly think that you guys did a better job than I would have been able to. Thanks for keeping it alive and thanks even more for completing it during this last year. Thanks to you and Willrock for starting it and then allowing me/Chernabogue to take it over. It wouldn't have existed at all without you guys! 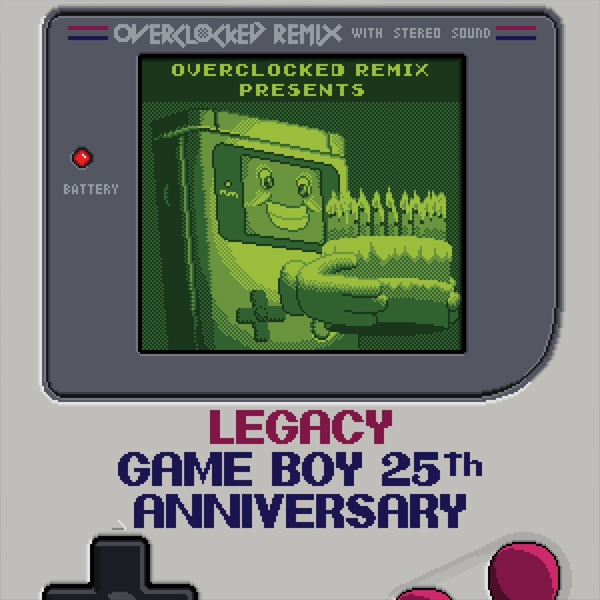 It was an honor to work on this amazing musical tribute to the Game Boy with some of the greatest remixers I'll ever know. Chernabogue is also a great friend, a very nice guy, and proved to be an invaluable director as he helped organize the album. This album brings back a lot of great memories -- I hope you will find it to be a fitting tribute to the Game Boy, several great games, and the legacy of Gunpei Yokoi. The Game Boy was the very first video game system I ever got, and I had to share the only one at home with my little brother. Even if I never got a lot of different games, it was one of my first video game experiences. Directing an album is always an interesting and somewhat difficult task, especially on a short deadline. But the dedication of Brandon and of all the artists involved in the project made it possible. I sincerely hope people will enjoy this album as much as I enjoyed co-directing it.